Smarten Up--It's Time to Choose the Right CollegeThink that your life's growth, success, and happiness depend on which college you attend? The higher-profile school, the better, right? Wrong! Neither is true.Written by, yes, a Harvard grad, Harvard Schmarvard rebuts the perception that image is everything when it comes to college and emphasizes this simple fact: What you will be measured by in life is your talent and energy, not your college's name. Packed with practical information and insider tips, this must-have guide will help you determine which school fits you. Inside, you'll find:·How to survive the application process without losing your sanity or sense of humor ·Tips on writing essays, visiting campuses, and keeping cool during your college interviews ·The truth about search letter scams and the early admissions game ·Plus loads of other invaluable insight!So take a deep breath and exhale your worries and fears. 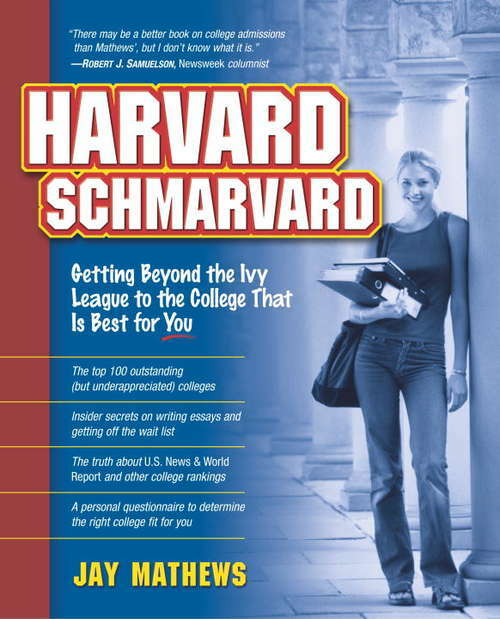 Let Harvard Schmarvard debunk the myths, expose you to the truth, and clear your mind so you can weigh what's really important.From the Trade Paperback edition.